Why I read this book: As a youth worker, I always want to be aware of and sensitive to families that are dealing with mental illness. I am constantly searching for books that might be a resource for my ministry OR for families dealing with these situations. - "Denial never means something doesn't exist or didn't happen, just that the pain of recognizing it seems to outweigh the potential benefit of being vulnerable and seeking help." - "Even Christians get depressed. Unfortunately, Christians are often the ones who most feel they must hide their pain and pretend that nothing is wrong." - "Depression can turn us into a person we don't recognize." - "Some days I had to borrow other people's hope because it felt like mine had run dry." - "When we compare ourselves to others, we focus on all we do not have." Who I'd recommend this book for: Many progressive Christians will struggle with the language in Hope Prevails (in particular with its emphasis on how "Satan uses three primary tactics to perpetuate our depression... He seeks to kill our joy, steal our peace, and destroy our identity.") In contrast, many evangelical Christians will resonate with Hope Prevails and find it to be a useful tool in practically fighting depression. 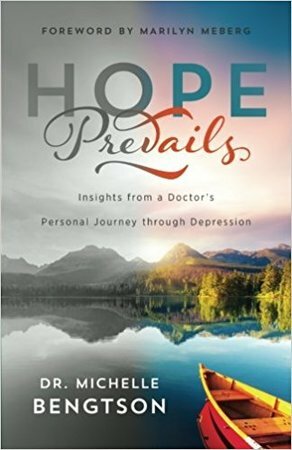 Disclosure: I received a free copy of Hope Prevails: Insights from a Doctor's Personal Journey through Depression in exchange for a fair and honest review.